The Island Beaches of Fernando de Noronha, Brazil . The main island of Fernando de Noronha consists of many beautiful beaches, still in their purest natural form. Fernando de Noronha is a cluster of extensive islands of volcanic origin, located about 350 km(217,4 miles) off the coast of Brazil. Most of the islands are declared a marine park to preserve the natural beauty of the 21 islands and islets of Fernando de Noronha. Each of these beaches has a great history behind them but the best that these beaches offer you are the numerous opportunities and unique experiences of nature, adventure and entertainment. The beaches of Fernando de Noronha appear straight out of a fairy tale dream. No manicured beaches, just wild free spaces below and the blue expanse of the sky above, stretching miles on to give you a glimpse of the numerous activities happening under-water and above. The sea being mostly calm, allows easy access between the beaches. So it’s a great opportunity to trek between the pristine beaches and explore the undulating expanse of sand and seas of Fernando de Noronha. 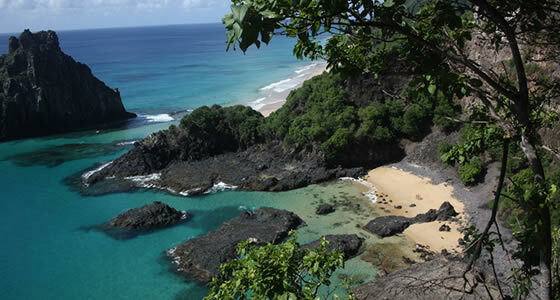 The beaches of Fernando de Noronha are mainly of two types- the inside sea and the outside sea. While the inside sea lies towards the Brazilian coast, the outside sea lies towards Africa. These beaches are perfect tourist spots that give you value for your money. The waters at Fernando de Noronha teem with the exuberant activity of marine life giving you a peek into its wide array of species and coral formation. The ideal climatic conditions make these beaches the perfect place for scuba diving, swimming, surfing, etc. Praia do Leao and Baia do Sancho are considered to be the best beaches of Brazil and the pride of Fernando de Noronha. The crystal clear water in both these beaches is perfect for swimming and snorkeling. However, there are some beaches to provide you with some marvelous views of the setting sun and birds diving for food into the water. If you choose to walk between the beaches, you will get to see a number of nests of aquatic birds as you hike through the rocky cliffs and crags. No where will you get to watch these nesting sea birds except in Fernando de Noronha, one of the largest nesting grounds for sea birds. Almost all the beaches of Fernando de Noronha have a great history behind them, and each beach promises to give you an experience of a lifetime.